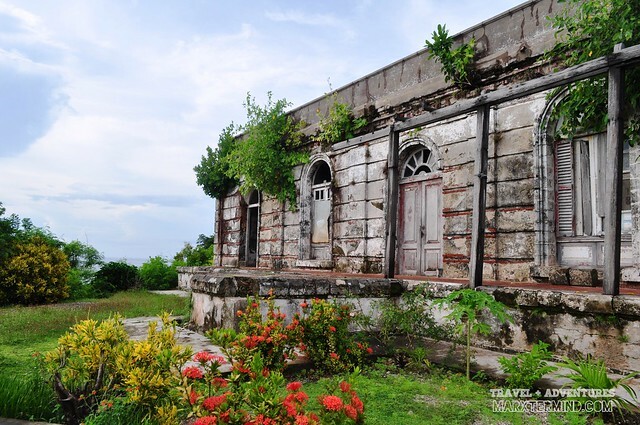 Isla De Gigantes is not just about islands and beaches. 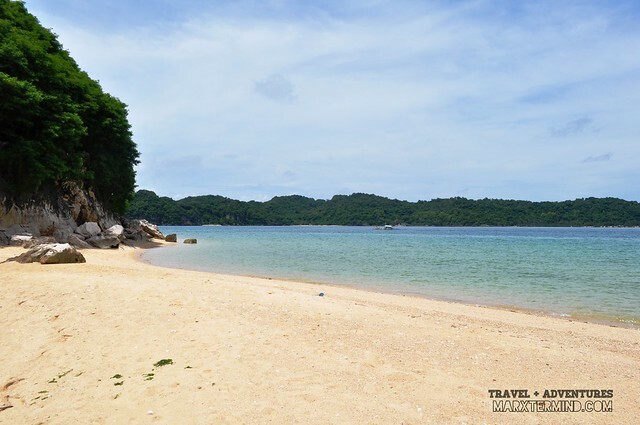 Aside from island hopping, there are still some activities to do inland that will truly add to a great Isla De Gigantes experience. With towering rock formations and rich natural resources, there are so much more to see and explore on these collective islands. 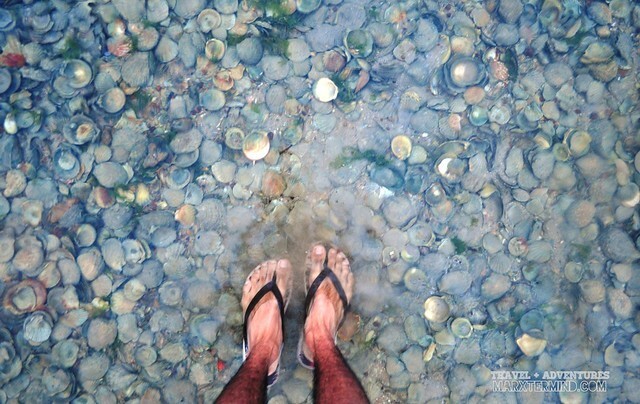 It was surprising to see seashore covered with shells when we set our foot in barrio of Asluman, Gigantes Norte. We then learned from our tour guide that scallops is rich in the area thus why shells are everywhere. Carles is not only rich in scallops but also with other marine life. 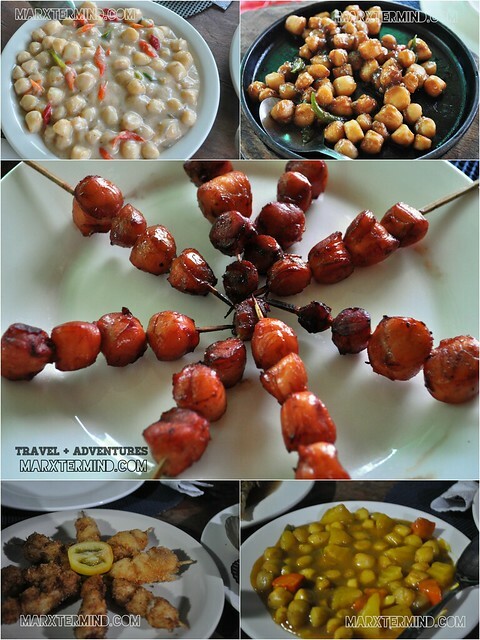 During our 2 days stay in Gigantes Hideaway Inn, every meal we had were served with scallops. This type of seafood was cooked in different type of dishes but to lessen the fed up factor for this food, we also had fish and crabs. 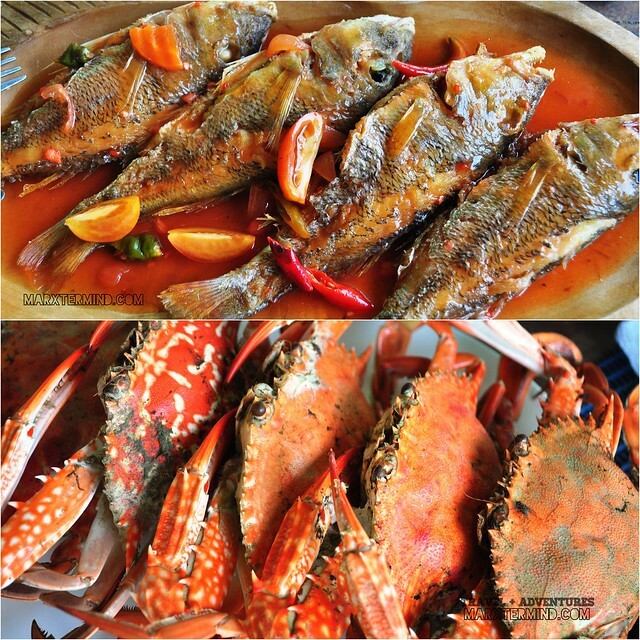 Our visit in Isla De Gigantes wasn’t just about touring the different spots but experiencing the food specialties this place offers. We were supposed to wake up early Morning to witness the sunrise from the lighthouse but it rained so hard. Me and one of my companions, Ian, were so eager to witness the sunrise so we walked to the mangroves area and waited for the sunrise from there. Clouds were still hindering the sun to shine even the rain has already stopped. The 5:30 AM call time became 7:30 AM as we still waited for the rain to stop. When everyone’s ready for the tour, we then hopped into our assigned habal-habal (motorcyle) going to the lighthouse. The round trip fare costs PHP 60 each with one way travel time of 15 minutes. When we reached the end of the paved road, we alighted from the motorcycle and started to walk through the muddy path going to the lighthouse. It took us about 10 minutes to reach the light house. There’s no entrance fee to get to the lighthouse but donation is encouraged. When the care taker opened the lighthouse door, we went inside and walked through the staircase to reach the top of the lighthouse. I didn’t know that I’ll be that scared as we go up. The lighthouse is too high. It could have been an amazing sight to see the sunrise from here. 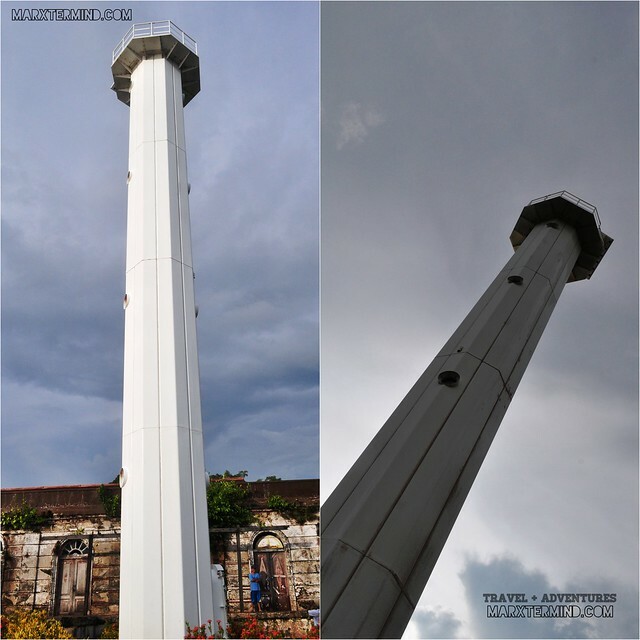 The lighthouse is new replacing the old lighthouse that has been destroyed by Typhoon Frank. It is solar powered, charging everyday. A maximum of 10 persons can only be accommodated at the tower. After having some photo ops, we then decided to go back to the ground. A ruined structure is also in the area that seems to be normal for lighthouses in the country. I’m not sure what area is this called but I just noticed that every lighthouse I visit has such structure. One of the activities that I didn’t see coming sooner that I was able to do in the island is spelunking. It was already more than a year ago since I had my last cave exploration by foot so when I learned that there is such activity in Isla De Gigantes, that made me more excited. From the resort, we had another habal-habal ride going to Bakwitan Cave together with our guide whom we hired to help us with the activity. 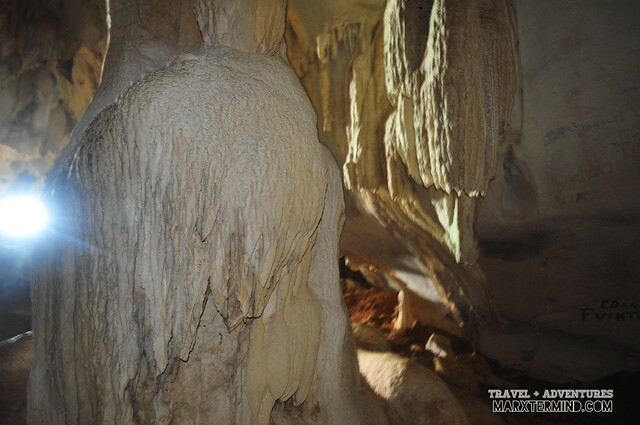 It is a must to get a guide when doing spelunking in Bakwitan Cave. A guide costs PHP 200 (or PHP 400) for a group of 4 or 5. 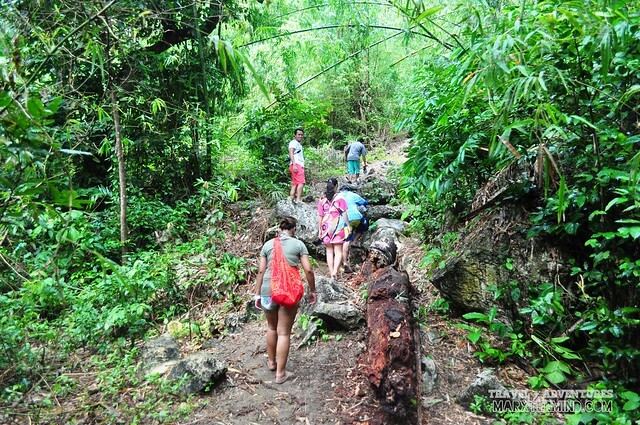 The hike going to the cave entrance was very challenging as it had just rained. We were so unprepared for the activity that we forgot to put insect repellent; which why I got a lot of mosquito bites on both of my legs. If I’m not mistaken I got around 30 bites; the worst. We felt so relieved when we finally reached the entrance as it was really a struggle to get to this area. We wasted no time and entered the cave as it seems cooler inside. 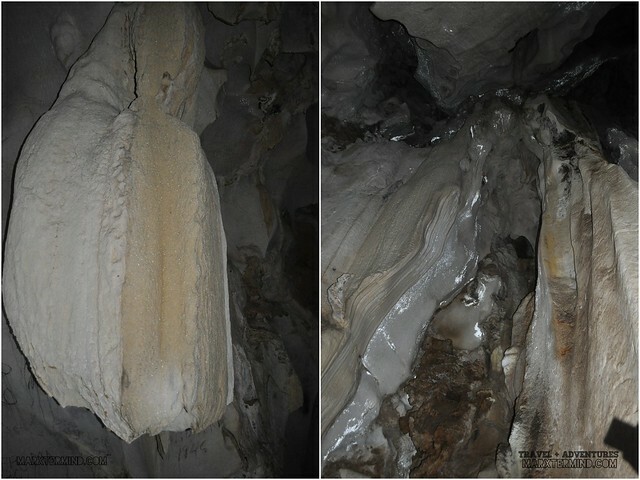 I felt so sad that the cave looks dead already; no signs of life, vandalism everywhere. I hope the town of Carles could make a move to preserve this cave. The cave has two levels. We were unprepared and we weren’t able to bring any rope or material when we ventured into this activity. When we reached the mid part of the activity, we’ve decided not to proceed anymore. Our guide told us that it’ll took 2 to 3 hours to finish the spelunking activity. 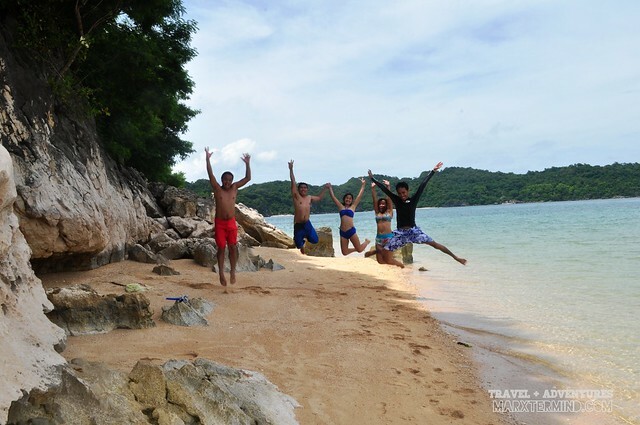 Because we felt short from the island hopping activity that we did, we asked our guide to bring us to a nearby beach wherein we could take a swim so he brought us to Langub Beach. 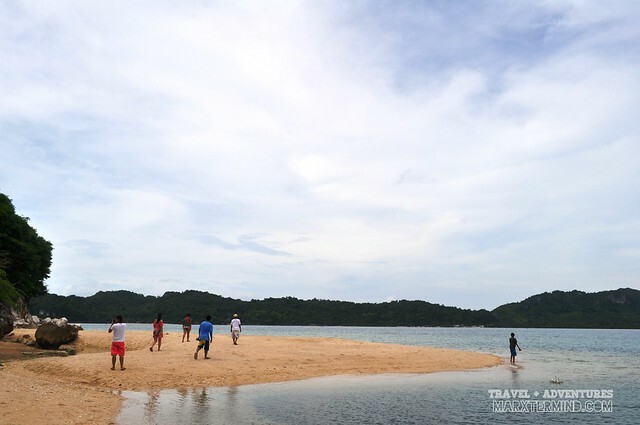 Langub Beach is 15 minutes ride from Bakwitan Cave. The sand isn’t that fine but it’s white. The water is OK; just enough to suit our need for beach bumming before we leave this wonderful island. There were no other tourists in the area but us. Who said jump shot isn’t a hype anymore? Not for us. It was nearing noontime when we’ve decided to go back to the resort. 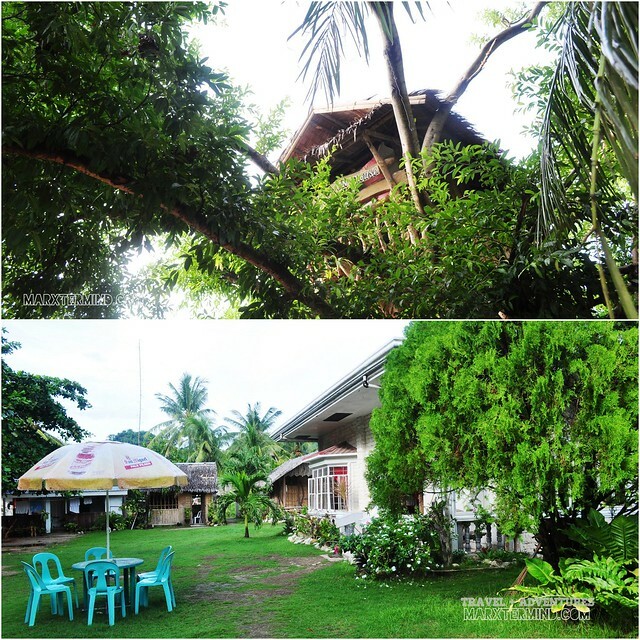 One of the nicest place that I’ve stayed in was Gigantes Hideaway Inn. It isn’t just about the vicinity but how welcoming the people are. 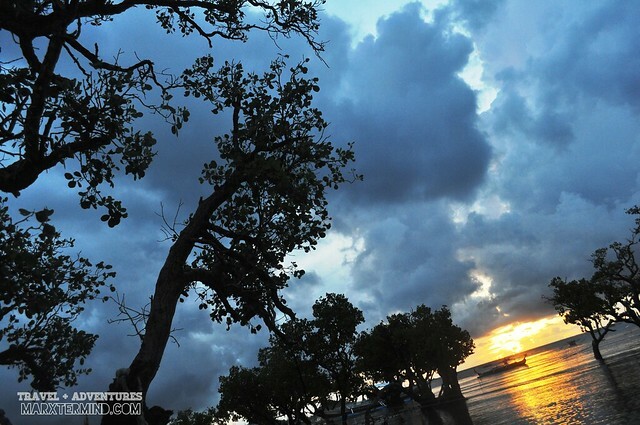 During our trip, our group stayed in two of the nipa huts fronting the mangroves area. There are no private bathroom, no air conditioning but that is perfectly fine as we wanted to experience such accommodation. 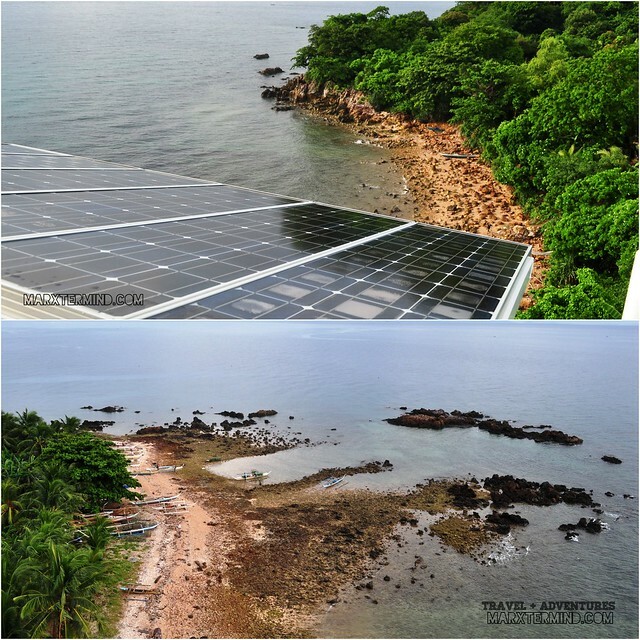 Electricity and generator in the island only run from evening to early morning. 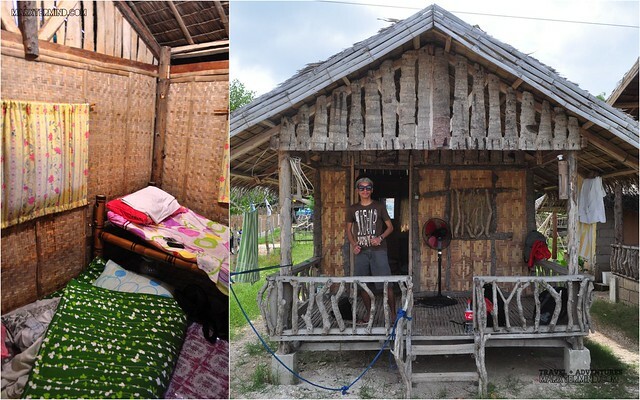 It costs PHP 250 each per night for our accommodation. The cost of the meals which they served during our entire stay depends on how much we had consumed. The fee for the cooking service depends on how much you’ll be giving. They assign tour guide for every group. There’s no standard rate for them so the fee for the guides depend on how you will be giving. But just a piece of advise, if you find your guide accommodating and friendly; be generous. Roughly we spent PHP 3,500 each for a group of 5. I couldn’t be able to breakdown the expenses anymore but be prepared with such amount when visiting the island. We left Gigantes Norte at 1:30 PM by chartered boat. We arrived at the port of Estancia at around 3:30 PM. Good thing we were still able to catch the last van bound to Iloilo city at 4:00 PM. It was a great experience exploring Isla De Gigantes. What’s also nice about this trip is I was able to travel with strangers who I’ve met from a forum site. I appreciate the trust that the couple, Ela and Emerson, gave to me in planning this trip. I’m hoping to spend another travels with you, guys. Would you believe, Emerson knows our office mates? Such a small world isn’t it. Hello Led, thank you for correcting me. Yes it's Bakwitan. I have changed it now. Isn't the cave named Bakwitan, not Langub? 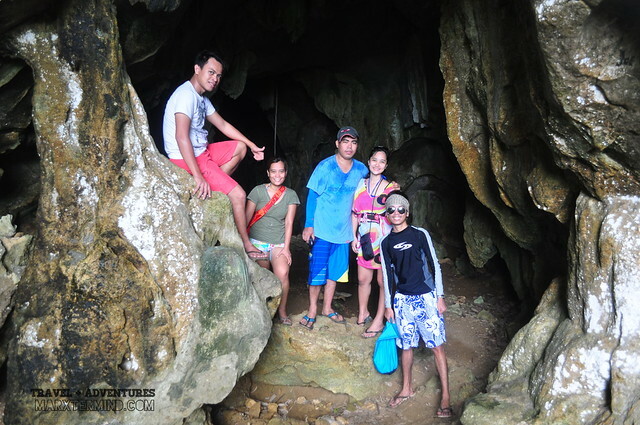 We also did spelunking there when we visited Islas de Gigantes a few months back.